With the kids home from school for the summer, you might be looking for a way to keep them busy. 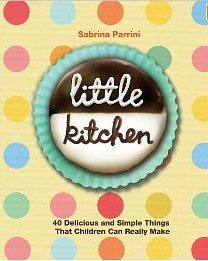 LITTLE KITCHEN: 40 DELICIOUS AND SIMPLE THINGS THAT CHILDREN CAN REALLY MAKE by Sabrina Parrini is a perfect cookbook for summertime, when things are a little less rushed and you have more time to experiment together in the kitchen. The time commitment for these recipes is much more than most cooking-with-kids cookbooks. However, in the end, the kids learn real skills in the kitchen and are better prepared to tackle real recipes on their own as they grow. It's a great way to learn together and a great activity to fill those summer days when kids say "I'm bored. I have nothing to do."